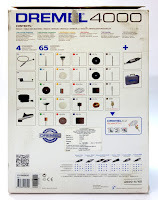 Dremel is known for making one of the best high speed rotary tool. For those of you who dont know Dremel brand is part of Robert Bosch tool corporation. This is a versatile tool and can be used for variety of tasks from carving, polishing, grinding, cutting, drilling, routing etc. 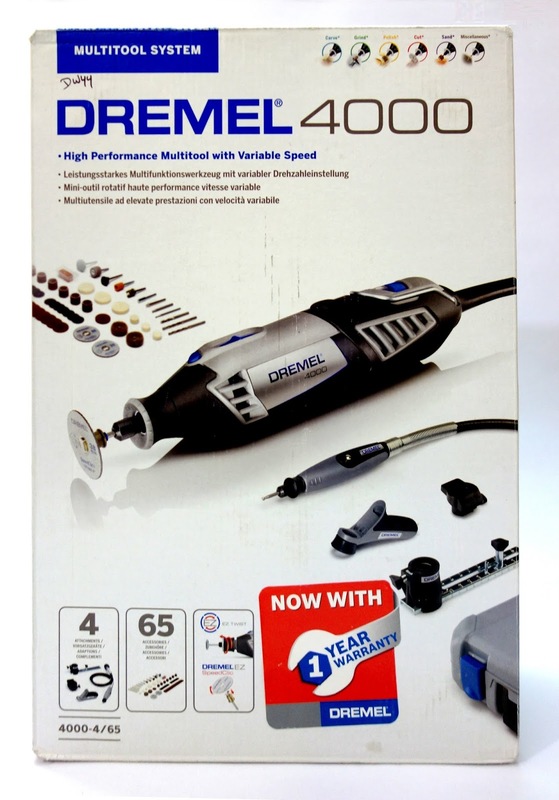 Dremel 4000 series is the top of the line corded model in Dremel range. The main difference between the Dremel 3000 and Dremel 4000 is that Dremel 4000 has electronic feedback control, it basically means a normal rotary tool will begin to slow down under load but a tool with electronic feedback control will resist this load by giving more power to the motor resulting in a consistent RPM . 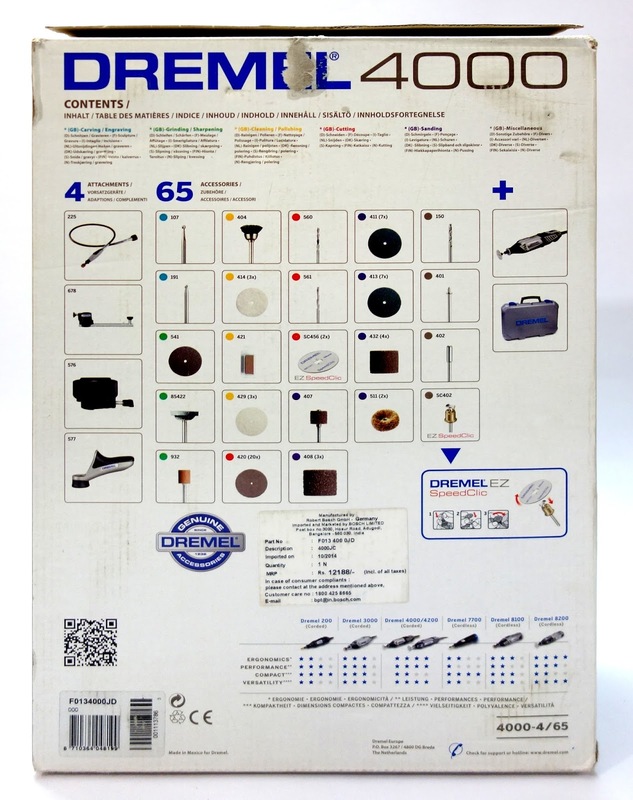 This particular model "Dremel 4000-4/65 (F0134000JD)" comes with 4 attachments and 65 accessories. It costed me around Rs.8200. I have used this tool in quite a few projects especially in the electronics and craft projects. The tool feels very comfortable to hold and use it is also fairly quite at low to mid speed levels so it can be comfortably used when i work late at night without disturbing the neighbours. This rotary tool comes with a good quality storage case in which all the attachments can be stored properly. Case also has moulding to store additional attachments which do not come with this variant. This particular model (Dremel 4000-4/65 F0134000JD) comes with 4 attachments. Out of all the 4 attachments that come with this tool i find that the Flexiable shaft is the most useful. This attachment provides great control for doing fine work. Apart from these attachments there are other attachments for this tool that can be purchased separately. The power of the tool is 175W, for doing light work this is enough but the tools starts to struggle on medium work load. For example while using the circle cutting attachment to cut circle in 6mm plywood for my Homemade Centrifugal Fan project i could feel the tool stressing quite a bit. The collet size of the tool is 1/8" or 3.2mm. You can also buy a chuck attachment separately which supports opening from 0.4mm to 3.4mm. There is a speed adjustment knob on top of the tool. Also there's foldable metal hanger on top to hang the tool when using the flexible shaft. Accessory are stored in their separate case which comes with the tool. This model comes with 65 accessories. Although this is a very good tool but when it comes to buying new attachments you will find them to be extremely expensive. This tool is good for doing small and fine parts of the project that cannot be done by any other tool you have. For example if you are cutting lot of sheet metal then I would recommend using an angle grinder with a cut off disc as the original cut off discs from Dremel are expensive, difficult to source and also the tool is a bit underpowered for heavy tasks. The collet size 3.2mm is a standard size and if you can source accessory from other suppliers then this will greatly reduce the investment cost on accessories. I have bought a set of 174 accessory from aliexpress for around 11.99$ same accessory if I would have bought from Dremel it would have easily costed at least 50$. I would recommend buying accessories which don't require replacement often like carbide carving bits and engraving bits from Dremel as the quality of these accessory from Dremel is very good. Could you give me the name of the aliexpress store you bought your dremel stuff from? and how long did it take to arrive? price has gone up by 1 dollar though. It took close to 50 to 60 days for the package to arrive.